My daughter and I went back to Pinnacles National Park for the third week in a row. Having been bitten by the climbing bug, she couldn't seem to get enough of it. I picked out a few more of the easier routes from David Rubine's guidebook and we headed out from San Jose by 5:30a. It wasn't expected to be as warm as it had been the past few weeks so we didn't start quite as early as we'd done the previous week. The weather turned out to be quite nice, even a little chilly for the first climb. While driving south on US101, we witnessed a weak orange glow in the sky creating a plume of smoke behind it, then suddenly going out, the smoke remaining. It was about half an hour before sunrise but the cloud had a faint glow unlike the other clouds in the sky that were quite dark. UFO? Plane going out in flames? While pondering what it could be, I suggested it might have been a rocket test from Vandenberg AFB in Santa Barbara County. Jackie looked it up on her phone and sure enough, their launch schedule listed a Delta II rocket launch for just this time. "How did you know that?!" she asked incredulously. I just smiled. It gets harder to impress our kids after they become teenagers, so I take my trophies when I can. The sun was up by the time we turned off SR25 to the East Side entrance, the High Peaks lit up as we drove into the Bear Gulch area just after 7a. Our first stop was not far up the trail at Discovery Wall, where we were looking for a three star, 5.6 route called The Portent. Having never been to this area before, we had trouble matching the routes to the maps in our guidebook. I didn't want to get the start of the route wrong because any mistake meant we'd be climbing at a grade above 5.7 which would surely be trouble. After walking back and forth along the wall with no better understanding, we decided to try something else. 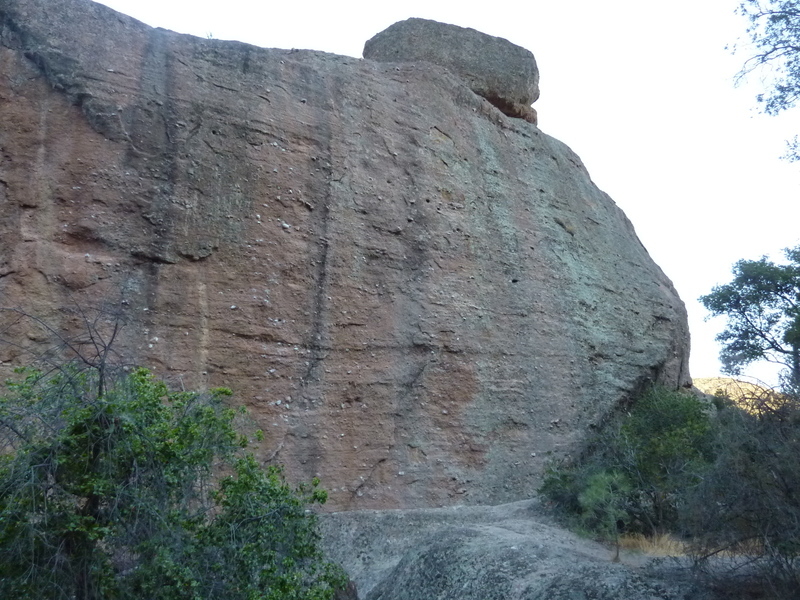 This is an impressive feature poised above the Bear Gulch Cave System, a giant rock conglomerate 80ft high, nearly vertical or overhanging on all sides. There are more than a dozen steep face-climbing routes scattered about on three sides of the 50'x100' rectangular block and only one of them was 5.6. In fact, it was a run out "5.6R" rating that gave us great pause before we started. On the east side of the block there is a boulder leaning against it that serves as the start. The first bolt is about 15' up and slightly to the right where the fall line goes down 30' into the cave below the starting boulder. Though there is a bolt on the starting boulder to serve as an anchor, a fall before the first bolt would surely result in something close to - if not actually - death. And the real problem is the second bolt which is run out at more than twice the height of the first bolt which would result in an even worse fall. Jackie wanted to lead the route but the first bolt made her hesitate. I offered that I could probably lead to the first bolt if that would help, but she decided to do it herself. And she did a fine, job, too, cautiously moving up from one small knobby hold to the next. We both relaxed after the first bolt was clipped, then slowly worked up to a more nervous state until she had clipped into the second bolt. After that the climbing gets a little easier with juggier holds and in less than five more minutes she had reached the belay anchors above. 15 minutes later I had joined her, quite impressed with her lead. We weren't quite done, because atop the large, flat summit area is a second boulder which forms the highpoint. Low fifth class scrambling on the west side leads to a register box bolted to the top of this higher block. Jackie's downclimbing skills still need some work - though I remind her to study the moves she used to get up, she wasn't as confident on the way back down where I helped her with a few foot placements to complete the sequence. The long rap down from the Monolith was fun, with the added twist that we had to go down at a slight angle to return to the starting block. After leaving the Monolith, we hiked the upper portion of the Bear Gulch Cave Trail to the reservoir, then the Rim Trail to the High Peaks Trail which took us to The Unmentionable. We had passed by this feature on our previous trip and without knowing it had a name, noted its phallic resemblance. A short but steep side trail leads down from the High Peaks Trail to the feature where a 5.7 route goes up the shoulder from the uphill side. Jackie led this short climb, about 25' in length with a single bolt to clip just before a bulgy move. My photos of her climbing the route came out blurry, so the first one I have is of her belaying me to the summit. There are some bolts on the left side of the route that can be used for a harder variation. After rapping off the summit, Jackie went up this route in fine style, the crux coming at the very start. When it was my turn, I couldn't repeat the first crux move and didn't get even a foot off the ground before calling it quits. It's really quite remarkable how quickly her skills have exceeded mine. On our way back down the High Peaks Trail we stopped for a scramble route up The Anvil, rated 5.1X. The "X" in this case seems a bit dramatic. On the side away from the trail, there are scoops in the feature which allow it to be ascended in two steps. The first step has two juggy holds above which make it fairly easy. The second step is trickier. Jackie went up to the left of the shallow scoop, raining down bits of loose rock as she went. This suggested to me that it wasn't the usual way up and I found the shallow scoop easier and cleaner. There were numerous bolts on top that could be used to rappel from, or top-rope the feature on its harder sides, but these went unused by us. As the feature sits right next to the trail, it can't help but draw the attention of passerbys. As we were descending, a gentleman with his wife and daughter watched us and then excitedly wanted to climb it himself. It was quickly apparent that he had little climbing experience and I was torn between exiting quickly before an impending disaster, or helping him with the effort. I chose the latter, showing him the easier moves on the lower step first. Luckily, he thought better of it and decided just getting to the base of it was good enough. As we were leaving, we saw his daughter taking a look at it, but thankfully she, too, backed off it. Heading back down the High Peaks Trail, we turned at the climbers' trail leading to the top of Discovery Wall. Here we spent some time examining the various anchor bolts above the wall, matching them to our guidebook photos and trying to determine where The Portent was located. We had a good idea of what we were looking for and memorized some of the features below so we could find it upon returning to the bottom. Unfortunately, by the time we had returned to the trail system and found our way back to the bottom of Discovery Wall, a party of three had just started up the route. Jackie wanted to wait until they were done, but as they were a party of three on a 2-pitch route I suggested it could be hours before they were done. We would leave it for another time.